Errol: I hope I can go tonight! Must remember to wear my Totoro pin! 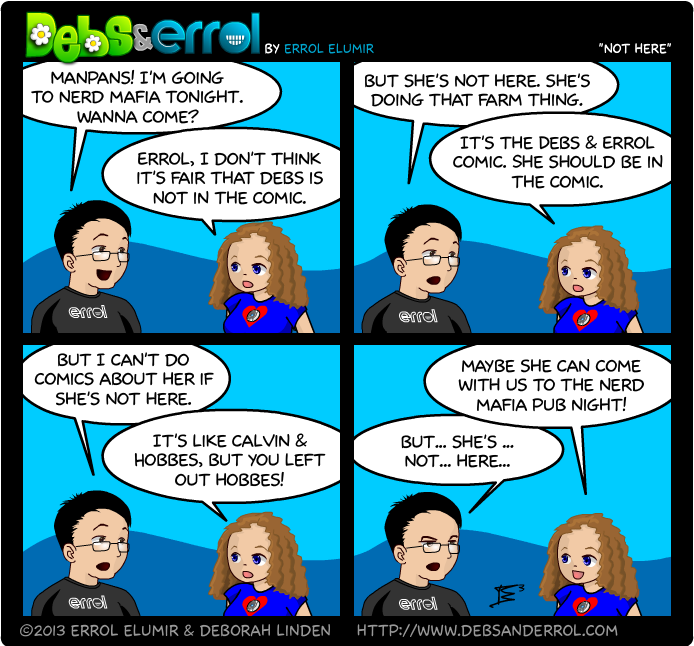 And some of you may be wondering why I would need Debs to be physically here in order to put her in the comic. She doesn’t, but I need an interaction. However, our schedules don’t allow it! When I’m online, it’s usually when she’s working. And when she’s online, I’m not. Sad state of affairs. [blurb name=debs]Yeah, the time difference makes it hard too. I’m usually off the computer for the day before the comic’s done, so I have to be all retroactive. Lesigh. ← 3GP- Episode 28- Indiegogo! We were thinking about this! 1) Debs has no time to write up/give me scripts. Mayhaps I should take over playing most of Tomb Raider and you can knit! Do you have a cat? They are very good at dive-bombing the invisible gremlins and chasing them out of every nook and crany. I have a theory that their purring creates a subsonic wave which persuades soot goblins to seek hearth elsewhere. Heh yeah I have a cat, but she doesn’t really help with that stuff. XD It’s happened in multiple (well.. two) houses over the years and it’s always when I’m alone for a long period of time. Let’s see… when I still lived up North first my dryer broke, which wasn’t too bad considering. Another year my heating broke. I had sewage backup in my basement that I didn’t know about for weeks since I have no reason to go down there. Finally I got trapped in my house by ice for a few days. Once I moved to Florida the air conditioning broke (in a brand new house than had been used sparingly before I moved). Then there was the war the frogs declared on me, basically there were hundreds of them all around both entrances to my house. I started carrying a hanger so I could flick them off the door. The same year somehow despite having a pest service, some roaches got in my house and also a wasp mysteriously got into my garage despite the door not being opened for days. Last year my water softener broke and almost flooded the garage. *thinks* I’m pretty sure that’s it so far. XD So yeah stuff that could happen any time but ALWAYS happens once I’m alone in a house. Wow, that is a truly impressive (and frightening) list! The Frog Plague sounds especially visual. Where are flocks of insane birds when you need them? The closest thing that has ever happened to me occurred a couple months ago. Each night for about two and a half weeks, I would hear this loud skittering in the wall right behind by head when I was trying to sleep. No one else in the house ever heard anything, but it sounded like something with very long fingernails was trying to scratch through the drywall and into my skull. We tried putting poison pellets in the attic, but it didn’t seem to help. Then, just when we were going to get an exterminator to look, it just stopped. But I think it might be back – I could have sworn I heard *something* earlier today. Again right behind my head, even though I was in a different room. That sounds terrifying. I already sleep with music but if that were me I’d have the tv on too.. and possibly some lights lol. So far, I haven’t heard anything more from the Thing in the Wall, but my cat was jumping around and mrawwled at the space where I last heard it, so I gave her some treats and am hopefully calling it good. a house to yourself for the summer?! That sounds awwweesooome! Frog Flicking – Tutorial Videos by Jezbel. I’m usually too busy screaming and trying to keep them from hopping IN my car to take pictures lol. Well the fish are still alive and no longer appear to be suffocating after having the fountain on all night. However the water level went down again. Ugh. Luckily it’s not too low this time.